The IEP Method “is about how we show up in the world and [hold ourselves] accountable for how we show up,” says Anese in this latest article on Forbes from Rob Dube. “We can’t control what happens around us, but we can control our state and how we interact with those things.” Read the full article here. “You’re Contagious, And That’s A Good Thing” December 2018 article by Paul Spiegelman. Enjoy and check it out here. Showing Up Column on Inc.
Anese’s column “Showing Up” is live on Inc.com — she posts about how to show up intentionally: in work, meetings, and relationships. Create more impact, lead more effectively, find greater joy, whatever you choose — these pieces are written with you in mind. Busy, Chaos and Change Are Not Going Away — So What Will You Do About It? Anese was featured on IBM’s Social Business Spotlight Blog with the article Busy, Chaos and Change Are Not Going Away — So What Will You Do About It?. In this article, Anese gives five principles that can help create a new reality when the chaos turns to burnout. Anese shares with the Inc. Small Giants community the basic truths and goals you should hold dear for your meetings, i.e., having clear outcomes, an agenda, clear next steps, clear roles, accountability, and a way to communicate outcomes and key tidbits to those who need to know. Anese lists the “Being” of the meeting, including… Be curious. Be helpful. Assume good. If you’re not sure, be curious. Always strive to be helpful. And when in doubt, assume good. There is most often (in my experience 98% of the time) a positive intention for what people come up with…even if it’s not clear in the moment. Get curious, what’s that positive intention? Seek to understand and you will build beautiful bridges together. Great stuff. Read the entire blog post here and you’ll never show up to another meeting the same! Anese is a contributor to the article on Michael Gerber’s site How To Grow Your Business Fast: 50+ Experts Share Their Best Scaling & Growth Hacks. It’s chock full of insights and tips on scaling and growing your business from successful business owners who have all been there and have great advice to share. Checkout the Chicago Tribune for the article “Try an Environmental Cleanup to Improve Performance”. The article talks about how your environment is one of the easiest things to take for granted, one of the easiest things to fall victim to and also one of the most powerful and effective areas to make changes in. At the end of the day, and in the moments in-between, your environment and how you partner with it is a choice. What are you choosing? Anese provides her expertise to The New York Times for this article, which was reprinted by The Sacramento Bee. Business Meetings Move Poolside (Don’t Overdress): “I love getting people out of their make-up and out of their natural state,” said Anese Cavanaugh, an executive leadership coach who likes nontraditional settings like spas and pool decks because “people tend to open up a lot more.” Read full story here. Anese writes about The Cost of Presence in Your Organization: Nine times out of ten, this is unintentional impact; people don’t even realize they’re having it. Once you have the awareness, it’s easier to shift. Anese discusses how the lowest vibration in the room wins and once you control your own energetic presence, you are contagious. She then goes on to share the 5-step Presence Reboot. Anese writes an article for COMMPRO titled “Our Presence Creates Our Impact: Using Mindfulness to Optimize Leadership and Culture”. She talks about how important our presence is, not only to ourselves but also others, and how it’s often overlooked in this world of “busy”. Anese writes a guest post for Tanveer Naseer on “Creating Intentional Impact That Brings People With You”. Check out the article for Anese’s 5-step framework to creating intentional impact. Anese is quoted in the Investor’s Business Daily article titled “Esprit De Corps Elevates Executives, Builds Business Bedrock”. This insightful article talks about how creating a positive culture at the workplace can boost employee morale, retention and the bottom line. What Does It Mean to "Show Up"? Anese writes for StrategyDriven on “What Does It Mean to ‘Show Up?’”. She includes The Five Components of Showing Up and, the better you are at doing these things, the stronger your leadership presence will be and the better your impact. What's the Business Case for You? Checkout Recruiter.com for the article “What’s the Business Case for You”. The article talks about how to make yourself standout when you are going for that new job or looking for that better position within your current company. It also references how Anese describes this in her book Contagious Culture, it’s all about bringing the “Essential You” out. Every action has an equal and opposite reaction — we’re contagious. It’s a basic rule of physics, but a challenging and oftentimes misunderstood principle in business. Click here to read the full article. It seems like every day I hear about a new technology company with seemingly supernatural powers. How else do you account for the ability to grow millions of loyal users in a number of months? To change the way we communicate and interact with one another? Apple, Google, and others have shifted human culture forever. So many organizations are looking to duplicate their efforts and disrupt the status quo. But that all begins with powerful leaders who have created an expansive corporate culture that encourages authenticity, curiosity, and creativity — the ingredients for becoming a super-powered company… No matter who you are and the culture you’re creating (intentionally or not), here are 4 counter-intuitive ways to tap into your corporate superpower and build a world-shifting culture. (Hint: “guardedness” and “competition” are in the mix.) Read the entire article here! Enjoy! Anese shares her insight on What Counts in this article for Enlightened Leadership Magazine. “I attribute the energy and clarity I’m experiencing to one core thing right now: I’m connected to what counts. For me. For what I’m up to. For the impact I want to create. For what needs to be created. In this moment. And in the next. And I’m taking care of myself in the process.” Read full article here. Anese takes us through two scenarios of someone being let go, with very different outcomes, in this article for the Harvard Business Review. Also included are some “Do’s and Don’ts” to consider when you need to have this type of conversation. What if I told you that you’re leaving a TON of potential impact, revenue and connection on the table? Regardless of your leadership prowess — no matter how great it is — if your intention, energy, and presence aren’t in alignment, you’re leaving a ton of opportunity on the table. We are ALWAYS having an impact. Whether you’re leading a meeting, or sitting in the back of the room — you’re having an impact on your own experience, and the people around you. Click here to read the full article. Did you know that 21% of the global workforce considers themselves actively engaged in their work right now (loyal, passionate, positive, enjoying their work)? 38% are actively disengaged (meaning they’re complaining, bringing morale down or looking for another job). And the remaining 41% aren’t sure where they stand. Wow! Click here to read the full article. One of the most common goals Anese sees with her clients is that they want to create a more open, productive and responsive environment, in their lives and organizations… here’s how. Click here to read the full article. Ever sit through a meeting and have no idea what happened? With increasing distractions, most of us struggle throughout the day to stay in the present. Now, in a budding trend, business coaches want to teach us how to have a conversation with a colleague or client without allowing our minds to drift. Click here to read the full article. Here are 5 quick tips to stay ahead of the game, keep your spirits up, stay in the most resourceful state possible, and make sure that you’re a stronger leader for your team, family and organization. Click here to read the full article. Anese’s Change This Manifesto “Showing Up: 32 Ways” is now available for download. Check it out for 32 ways to show up, propel impact and, when needed, get out of your own way. You have super powers galore — how will you use them? Anese writes for the Huffington Post about the ability to “decide.” She defines a decision as simply the intention and energy behind your word that you’re going to do something that propels, motivates and energizes you to move forward. You can tell yourself that you want to be successful, but until you decide, it won’t happen! We have to decide energetically from the inside out. Anese then goes on to explain 5 ways to truly know if you’ve decided to do something and where to look if you might be stuck. Click here to read the full article. Tools for Life, New breed of personal consultants teach skills to maximize personal and professional potential. Click here to read the full article. Join Anese and Rob Dube for a conversation about everything from creating a presence and intentional leadership culture to finding strength and success despite life’s struggles. Listen in here. Anese was interviewed for a second time by Dave Asprey, The Bulletproof Executive and the title of the talk was “Intention, Energy & Presence”. During the interview they touch upon how we get to choose how we interact with our lives and what that means for each of us, hiring and firing for the energetic good and so much more. Anese was interviewed by Jesse Lahey of the Engaging Leader Podcast and they talked about the Leadership Trifecta, 3 components of IEP and Anese gives 3 steps to reboot your presence in 30 seconds. Anese was interviewed by Srini Rao of The Unmistakable Creative Podcast and they talked about “Developing an Intentional Energetic Presence”. Listen in for Anese’s answers to questions like “Who did you hang out with in high school and what impact has that had on your life and career?” and “How did you end up doing this work?” (this answer includes a flashback to 14-year-old Anese and her job scooping ice cream). They also do a deep dive into the IEP Model where Anese explains each part of the model and how it applies to each of our lives. Enjoy! 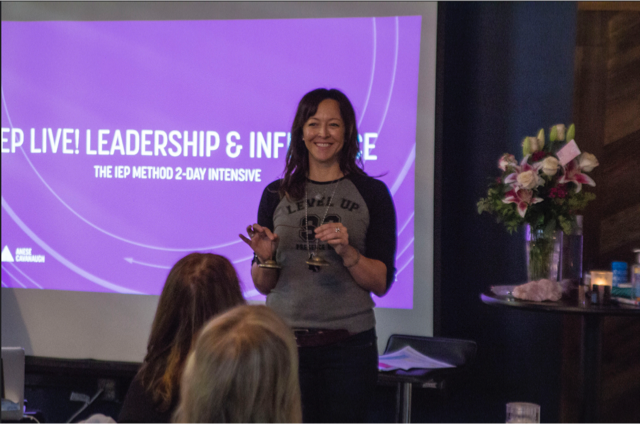 As a leading voice on intention, energy, and presence in leadership and culture, Anese Cavanaugh helps people unlock greater leadership potential, collaborate more inspiringly, create more openly, intuit more bravely, and lead more joyfully and effectively. Listen in as David Mammano interviews her in this ~40-minute Avanti podcast. Anese speaks with Jordan Harbinger from The Art of Charm about whether or not the way you’re “showing up” is helping you to create the impact you want to have. Interested in upping the impact you’re having? Take a listen to learn the five-step formula for creating intentional impact. Also discussed is who it takes to create a company’s culture (hint: it’s more than just the CEO). Anese was interviewed by Brent Stewart and Mary Rudder of the Everybody Matters Podcast and the focus was on building a positive workplace. Anese also gives examples of language tweaks that can help shift how you look at what’s going on for you (“I get to” versus “I have to”). Anese was interviewed by Bob Garlick of the Business Book Talk Podcast and they spoke about how important it is to hold your own energetic state while in meetings, as well as why it’s beneficial to do presence/energy checks during those meetings. Anese talks with Skip Prichard about how to create a positive and Contagious Culture. They dive into how the 5 components of Showing Up with IEP were developed as well as why choosing your impact is so important. Anese also shares how you can quickly shift your energy and gives steps to take to improve how we Show Up and how to increase positive energy. Anese has a follow-up conversation with Skip that includes 7 Game Changers To Improve Your Leadership Position. Check it out for actionable steps to take in assisting someone in shifting their state. During the “Bring Your Whole Self to Work” podcast with Mike Robbins, Anese walks us through her IEP (Intentional Energetic Presence) method, how leaders can show up more powerfully, and how business culture is created. Listen in here. Enjoy! Join in as award-winning entrepreneur, bestselling author Julie Gordon White interviews Anese on maintaining your energetic presence on this free iTunes podcast. Anese is interviewed by The Bulletproof Executive to talk about IEP and bio-hacking your impact. In this interview she and Bulletproof Executive’s Dave Asprey discuss presence, gratitude, the power of intention, using crazy words like “energy” in organizations, how not to be a “professional bummer,” and much more. You can hear the entire podcast here. For those not familiar with The Bulletproof Executive, Anese refers to it in her teachings and swears by Bulletproof Coffee to keep her head clear, energy high, and presence at its optimal. Dave Asprey teaches how to supercharge your body and upgrade your mind to have more focus, more energy, and more time at work and at home. Find out more about Dave Asprey and Bulletproof Executive here. Anese had a Q&A session with Paul Axtell and they talked about some great things including how leaders are contagious, what “intention” means to her and what advice she’d give to a room full of new professionals. She also offered up some advice to the CEO’s out there around working with millennials. Anese was interviewed by Abha Maryada Banerjee of BreakOut Radio and they discuss Intentional Energetic Presence (IEP) and how we show up has a direct impact on what we create in the world. In addition, they talk about the leadership trifecta and how adding a bit more awareness around your own IEP can really unlock the missing piece in your leadership. Anese was interviewed by Marty Wolff of The Business Builders Show and in addition to discussing Intentional Energetic Presence (IEP), they also talk about the quickest way to shift culture (at work AND at home) as well as 5 Leadership Game Changers. Enjoy! In this episode, Anese shared why we need to show up each day to live intentionally. Then we show you how to show up using the IEP Method (Intentional Energetic Presence). Listen in here. Anese was interviewed by Bob Dragone of LearnChair Radio and they discuss the IEP Method, the importance of “showing up” and how leadership is being developed in the U.S. today. On this episode, Zach Hoskins, Client Experience Architect sits down with Anese Cavanaugh, creator of the IEP (Intentional Energetic Presence) Method to discuss making a positive impact in the world! Anese and Misti Burmeister from the podcast, “Provoking Your Greatness” had a raw conversation on letting love inspire your leadership in the workplace. Listen in as they discuss “loving your nemesis”, “imposter syndrome” and much more! Enjoy! Anese is interviewed by Michele Price on Breakthrough Radio about company culture. They talk about ways to unlock greater collaboration within your team and Anese explains how being honest and naming it when something goes wrong is a really powerful leadership move. Anese speaks with Brendan Anderson and Jeffrey Kadlic from The Second Stage about the five steps to creating intentional impact, including knowing the outcomes you want to get out of any and every interaction and/or meeting. She also shares more information on her leadership methodology, Intentional Energetic Presence®. As a business owner and the leader of your organization, you hold the power to influence and create the culture around you, so why not make it positive and impactful! Anese speaks with Maggie Linton about busy. She explains that busy is a default answer and people are not being clear on how they are prioritizing. Anese then goes through the 7 reasons of why people say they are busy. We have more ways than ever to multi-task and stay busy, but the antidote is presence! Figure out what you’re grateful for in your busy-ness. Anese and Andy Drish of The Foundation sit down for a real heart-to-heart about showing up in times of serious muck and challenge. Listen and you’ll learn how to stay grounded when you are having a hard time, the concept of “bubbling up”, the effect of who you surround yourself with and so much more. Entrepreneurs Are You Intentional With Your Energy? Anese was interviewed for a 3-part series by Todd Reed of Inspired and Intentional Business and the first episode is titled “Entrepreneurs Are You Intentional With Your Energy?”. In this episode they discuss impact and how it affects not only ourselves but everyone around us. In addition Anese shares her ice cream “aha moment” that happened when she was just a teen. Don’t forget to check back for Parts 2 & 3! Anese was interviewed by Misti Burmeister from the podcast, “Provoking Your Greatness” and they had a great conversation around values, showing up and setting intentional outcomes. Listen in to find out a simple strategy to discover your core values as well as how to reboot your presence — right there in the moment — and why taking great care of yourself (mentally, emotionally, physically, and spiritually) is so important. Anese spoke with Nancy Marmolejo of the Itenco Podcast and they discussed a variety of topics including what Showing Up means (internally and externally), what exactly “Energetic Presence” is and Anese gives some thought-provoking questions for Nancy’s “The Daily Changeup”. Enjoy! Anese speaks with Bethany Crouch from FOX 40 about creating a healthy business culture. They also discuss Intentional Energetic Presence (IEP) and how these things benefit not only your business life, but your personal one as well. Head on over to Actionable Books for an excerpt from Contagious Culture titled “5 Steps for Setting an Intention”. In this excerpt Anese lays out for you 5 actionable steps to take to reach your goal (personally or professionally). Anese speaks with Inc. about many things that can change and improve your presence and impact. In the first video, she explains the 3 Ways to be Your Most Productive Self. The next video, she explains 3 Life Hacks to Increase Your Presence. The next video she talks about The Most Common Mistakes Women Make in Business. The next video, she talks about How to Get Your Opinion Heard and Influence Others. She then goes on to explain The Power of Presence to Improve Your Leadership. She speaks about the 2 Steps to Quickly Finding Your True Mission here. Finally, she speaks about how to Boost Your Energy and Creativity at Work.